With the outcome of multiple statewide elections still in the balance a week after Election Day, Florida’s Broward County has been the center of controversy amid recounts and allegations of voter fraud. Protesters from both sides of the political spectrum have arrived outside of the county elections office on consecutive days to criticize the process. With divergent goals and plenty of blame to go around, demonstrators held up signs showing their preferred candidates as they clamored for a more equitable and efficient electoral system. 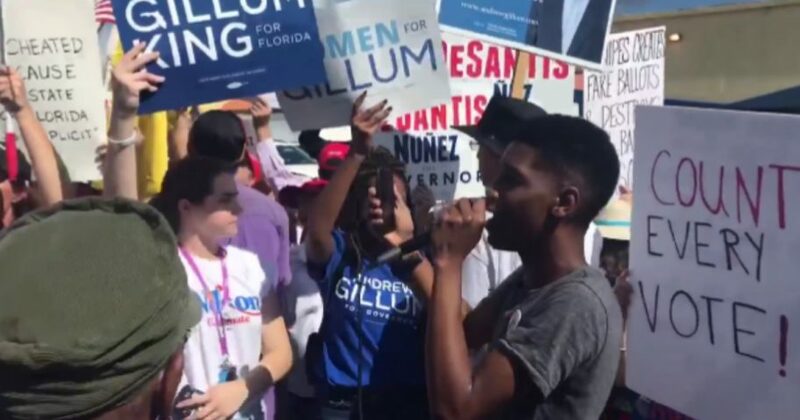 Despite their obviously partisan differences, Mediaite reported that protesters holding signs for competing candidates shared a common chant. “Every vote counts, every vote counts,” they repeated. Video of the protest shared by MSNBC’s Ron Allen has been widely shared on social media since Saturday. Much of the rhetoric GOP protesters have used in response to Broward County Elections Supervisor Brenda Snipes has come from the top, including public statements from President Donald Trump. Will you be confident in the final vote tally in Florida? As The Hill reported, Trump said the federal government could get involved in a recount as the county holds the key to Senate and gubernatorial races currently being narrowly led by Republican candidates. “If you look at Broward County, they have had a horrible history,” Trump said at a White House news conference last week. According to Independent Journal Review, Scott cited previous legal challenges to Snipes’ performance in a lawsuit he filed this week against the county. Scott, who is currently serving as Florida’s governor, was joined in his criticism by Lt. Gov. Carlos Lopez-Cantera, also a Republican.